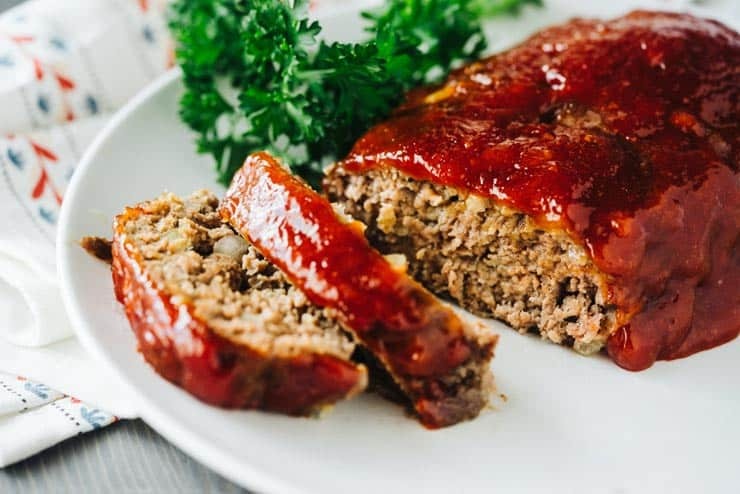 Tender and Juicy with a sweet ketchup glaze, this Classic Meatloaf recipe is what Sunday dinner dreams are made of! My Mom has been making this recipe for years, and we all agree it is the best meatloaf ever. What Makes A Great Meatloaf? In my world, a great meatloaf is tender, super moist, full of flavor and not greasy. And my friends, that’s exactly what this recipe is! 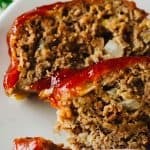 If you’re a meatloaf lover like me and have been searching high and low for the best recipe, YOU. CAN. STOP. NOW! 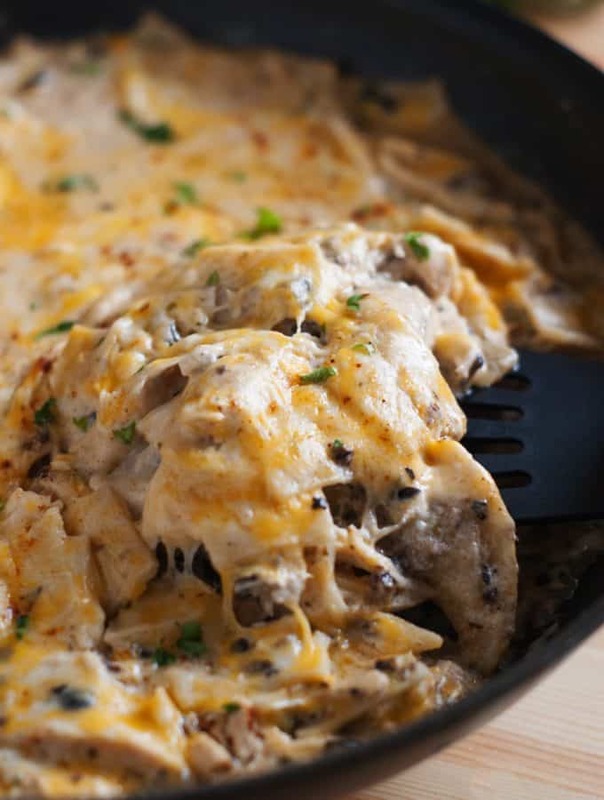 Serve with some Super Creamy Crock Pot Mashed Potatoes or Better Than Costco Mac and Cheese, and you have one heck of a meal! 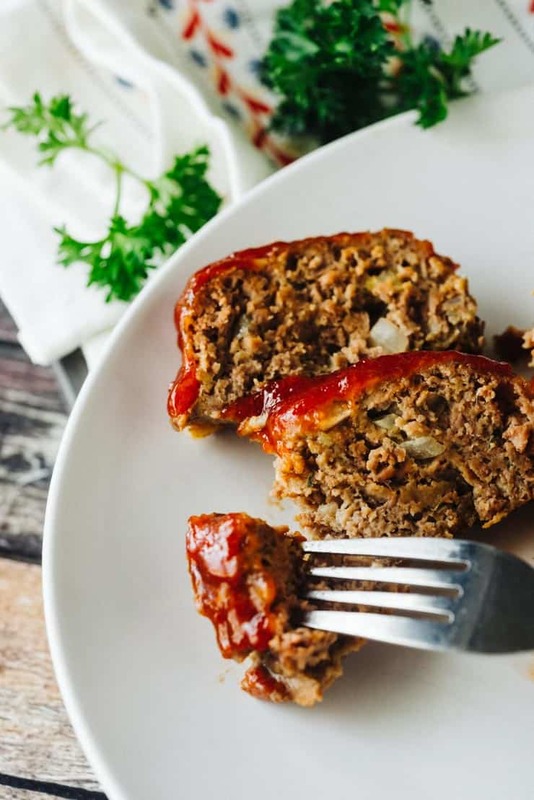 This traditional American meatloaf recipe uses a lot of the same ingredients as most meatloaf recipes do, but the way you might use them could be different. Let’s take a look! Ground Beef My favorite ground beef to use for classic meatloaf is 80/20 (80% beef 20% fat). I find this to be a great ratio of fat as it’s high enough to keep the meatloaf moist during the long cooking period, but not so fatty that it tastes greasy and unappealing. If you’re feeling wild, substitute 1/3 of the ground beef with ground pork for an extra flavor boost. 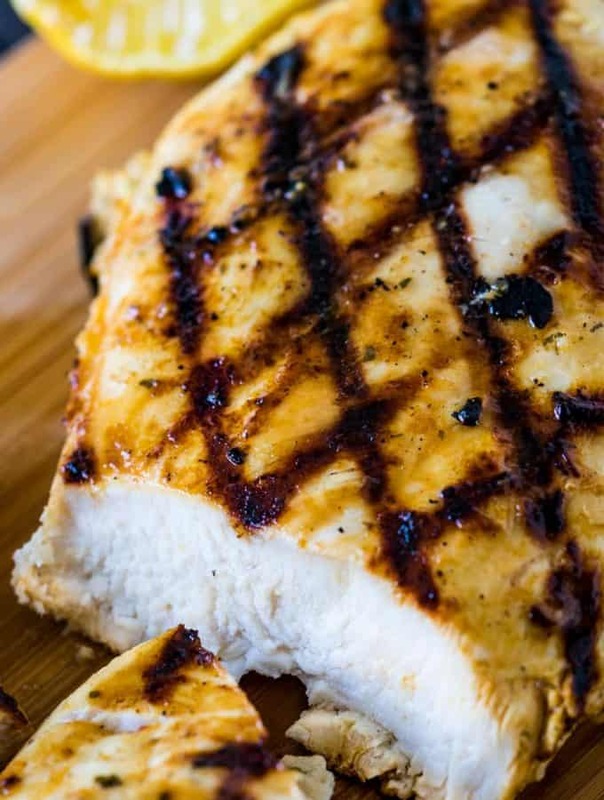 Pork is generally fattier than beef so you could use 90/10 beef if substituting pork and still have great results. Milk + Saltine Crackers The addition of crackers and milk in a meatloaf recipe, does two things: It binds the meat together and adds moisture, making the finished meatloaf tender and juicy. 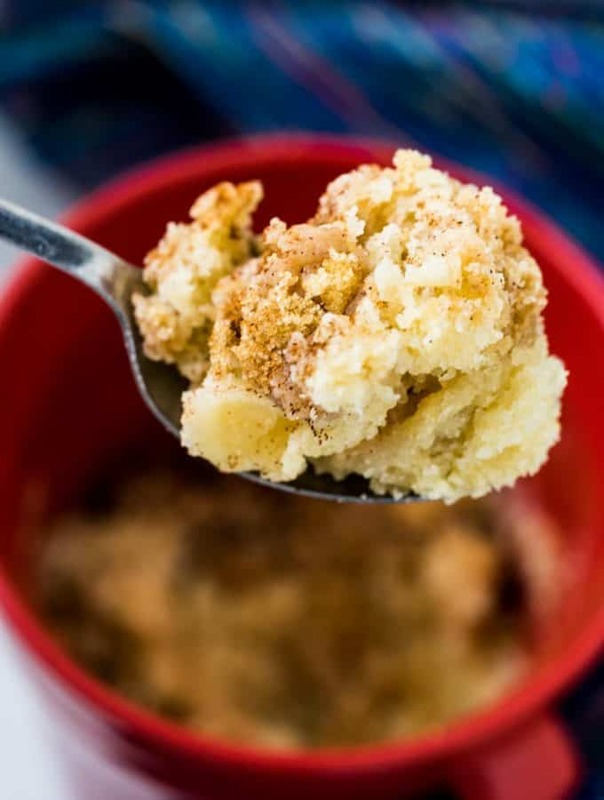 Crushed Saltine Crackers are my go-t0 whenever I need something like breadcrumbs to bind meatloaf, meatballs or even bread chicken tenders or fish. When used as a breading, saltines create a light, flavorful crust that can’t be beat! Onion When adding the onion into your meatloaf, it’s important to make sure you chop your onions finely. Large pieces of onion mixed into a meatloaf mixture will make it difficult for the meatloaf to hold its shape. Finely chopped onions will mix better into the meat, creating better flavor and a prettier loaf. Herbs I like to add two different herbs to my meatloaf: Sage and Dill. It might seem like an unlikely combination but stick with me here. The sage adds earthiness to the meatloaf while the dill adds a bit of brightness and that “hmmmmmm” factor. 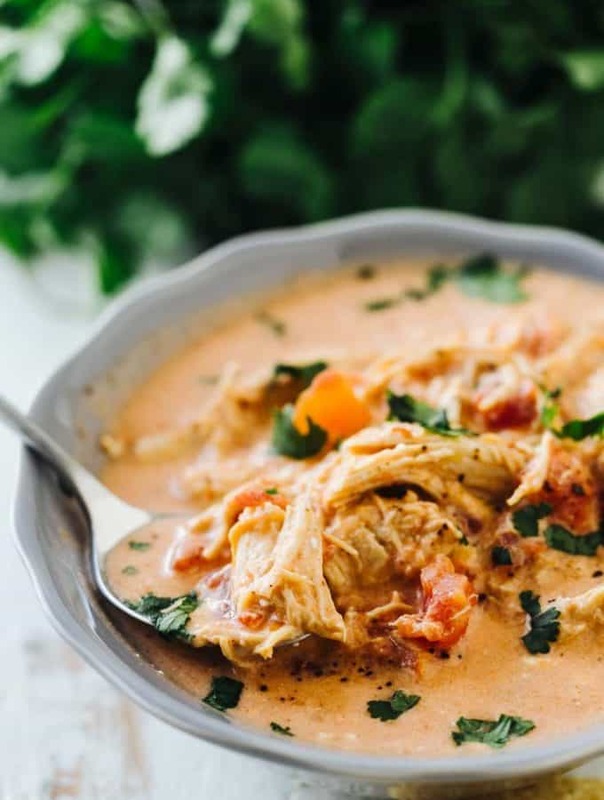 No one will be able to pin point the exact flavor, but it adds just enough to bring it a step up in overall tastiness. In fact, dill is one of my most-favorite herbs to add to beef recipes for this reason. 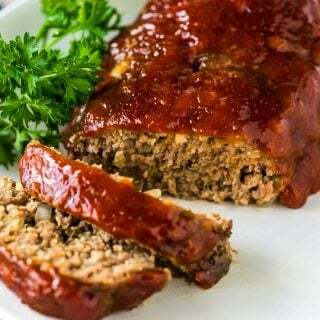 Ketchup No classic meatloaf recipe is complete without a ketchup glaze! 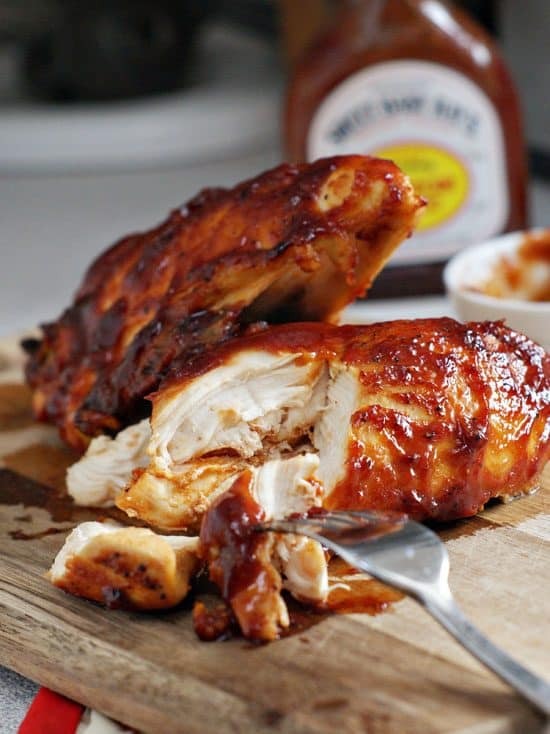 My glaze recipe keeps it simple and uses only ketchup, brown sugar and Worcestershire sauce. When making meat mixtures like meatloaf, meatball, or burgers, it’s important to not over-work or over-mix the meat. When ground meat is mixed too much, it turns it into a paste making it tough with an unpleasant texture. Just remember that it’s meat and not bread dough and to mix it gently and only until all the ingredients are incorporated. A panade is traditionally a combination of stale bread and milk, soaked until it creates a sort of a paste. It’s used in meatball and meatloaf recipes to keep them moist and act as glue. I talk more about it in this recipe. For this classic meatloaf, our panade is the combination of milk and saltine crackers. Before adding them to the meat, combine just the crackers and milk in a small bowl and allow them to soak and soften for a few minutes. Doing this keeps the crackers for soaking up moisture from the meat on contact, and makes a nice, homogonous meatloaf mixture void of big chunks of cracker. I like to bake my meatloaf on a cookie sheet, as opposed to in a loaf pan. Doing this gives me control over how big I want my meatloaf to be and allows all the sides to brown and create flavor. It also gives the cooking juices a place to go instead of just bubbling up in the loaf pan, creating a greasy mess. Line a baking sheet with parchment paper or aluminum foil and use your hands to form the loaf right on top. When it’s the shape you’d like it, wet your hands a bit and rub them over the surface of the meat. This step gives the loaf a smooth surface and somewhat seals exterior. 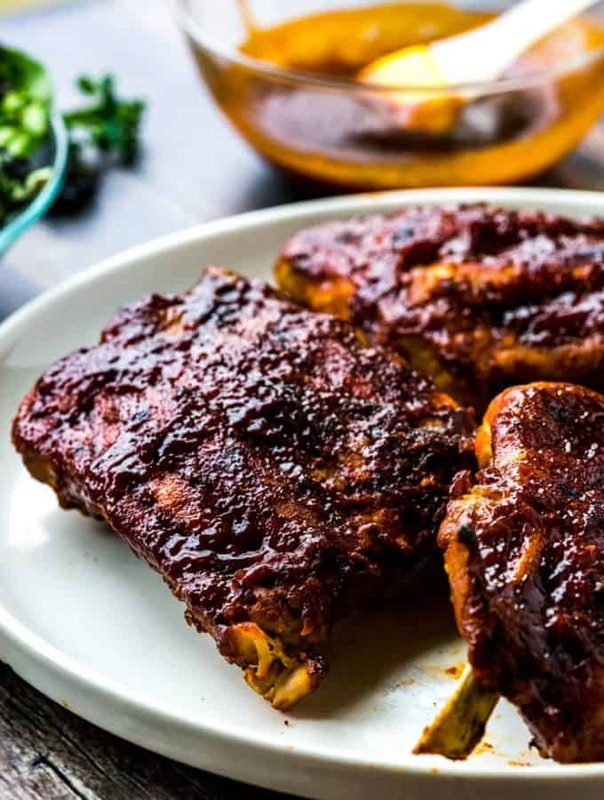 Combine the ketchup, brown sugar and Worcestershire Sauce in a small bowl. Put the glaze on the meatloaf in 2 phases once the meatloaf is about 1/2 way done cooking. Allowing the meatloaf to cook partway before putting the sauce on allows the meatloaf to brown slightly and the glaze to stick better to the cooked surface. Meatloaf is done cooking when the internal temperature reaches 160 degrees Fahrenheit. 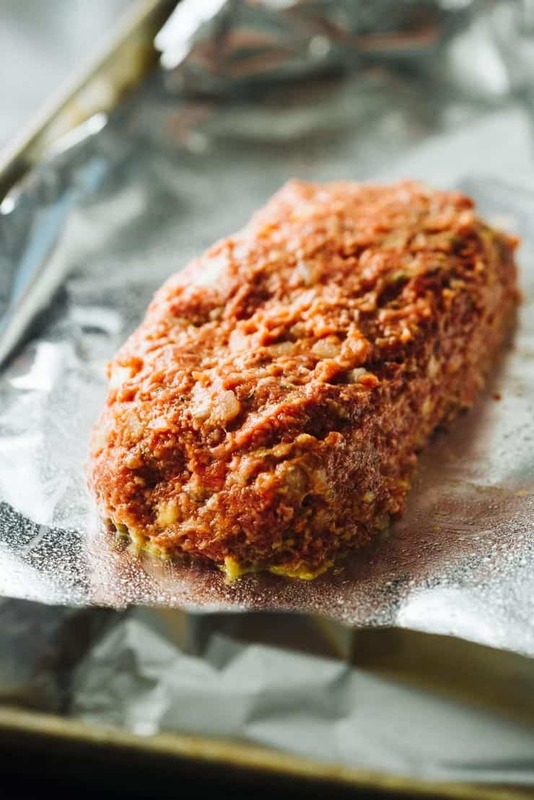 Use a food thermometer and insert into the thickest, middle-most part of the meatloaf to check. This recipe makes a 1 1/2 pound meatloaf, and I cook it at 350 degrees for about 40 minutes. Meatloaf needs to rest for about 10 minutes before cutting into and serving to allow the juices to redistribute inside. 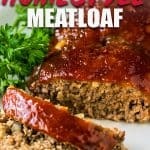 Can Classic Meatloaf be Frozen? Yes! It’s best to freeze this meatloaf it after it’s been cooked. Cook and slice the meatloaf and lay the slices on a baking sheet. Freeze the slices and store in an airtight container once frozen. Meatloaf slices will stay good for up to 2 months in the freezer. 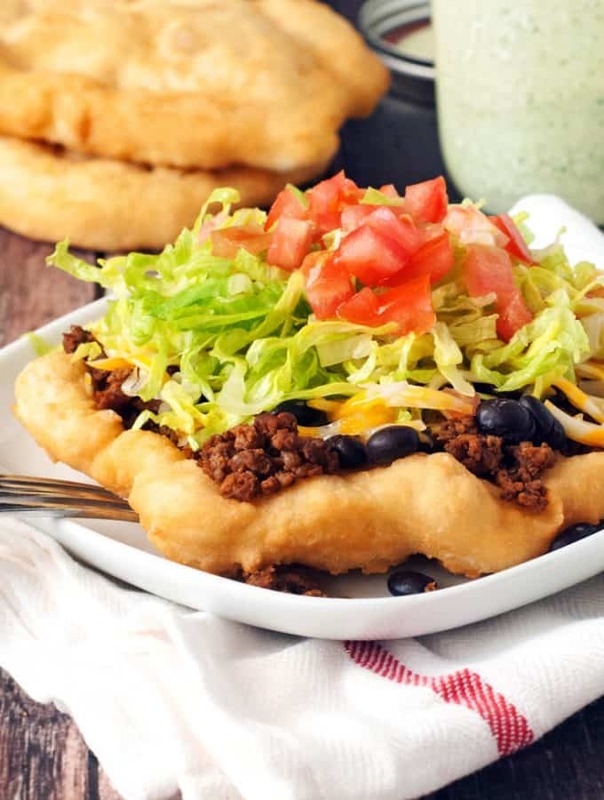 When you’re ready to eat, thaw the slices and reheat or place frozen slices in a covered casserole dish and reheat in a 375-degree oven. Enjoy! 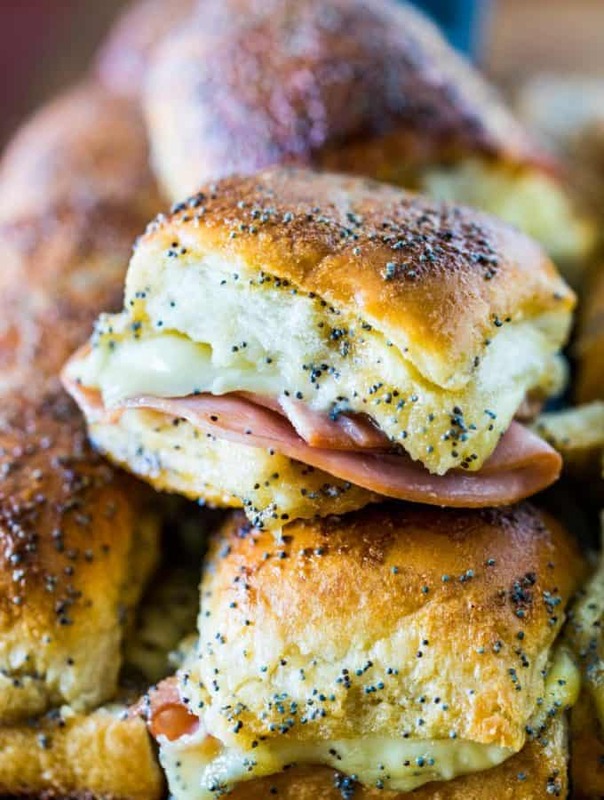 If you make this recipe let me know in the comments below! 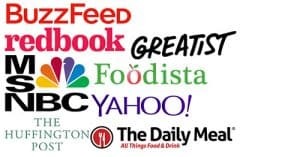 I’d also love to hear about your favorite side dish for meatloaf, too! It's an oldie, but a goodie-- Meatloaf! 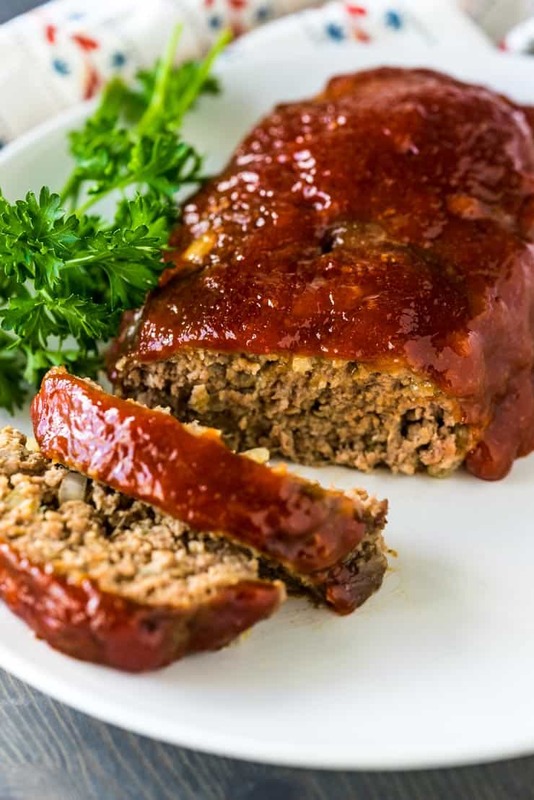 There's not a whole lot better than a tender and moist meatloaf and this is the PERFECT recipe in my book. Combine the milk and crushed saltine crackers in a small bowl. Allow to soak for about 5 minutes or until the crackers are soft. Whisk in the egg, salt, sage, dill, and pepper. Place ground beef in a large bowl and add in onion and milk mixture. Gently mix until just combined. Line a baking sheet with parchment paper or aluminum foil and shape meat into a loaf shape. Dip fingers in water and smooth out the cracks with your if needed. Place in oven and bake for about 20 minutes. Combine ketchup, sugar and Worcestershire sauce and spoon half of it over the partially cooked loaf. Return to the oven. Cook for 5-7 minutes longer and spoon the remainder of the sauce over meatloaf. Continue to cook until the internal temperature reaches 160 degrees-- about 10-15 additional for a total of 35-45 minutes total cooking time.